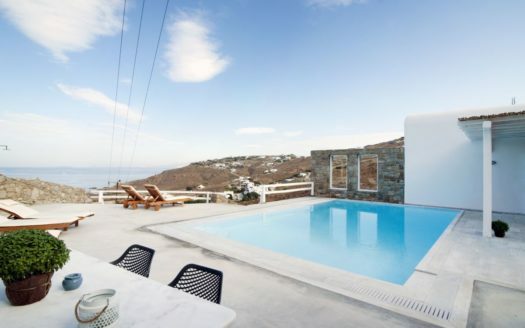 This beautiful cozy villa is located in the heart of the Mykonos town, Chora, offering a great opportunity for our guests to not only enjoy the charming town of Mykonos, and feel its rhythms, but also to relax and recharge your energetic balance by looking at magnificent Mykonian sunsets and enjoying the crystal clear blue waters of the Aegean. 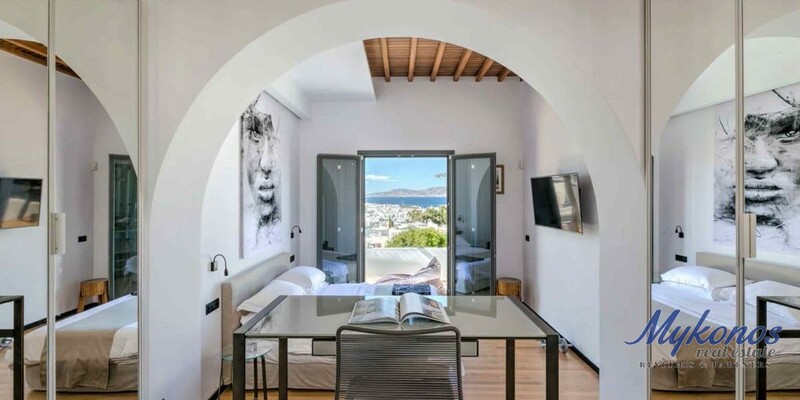 The villa was renovated in 2017 and thus, combines the traditional Cycladic elements with modern interior design and stylish furniture, ideal for those who enjoy the luxury lifestyle. The villa offers various amenities, which will make your stay a truly luxurious experience. 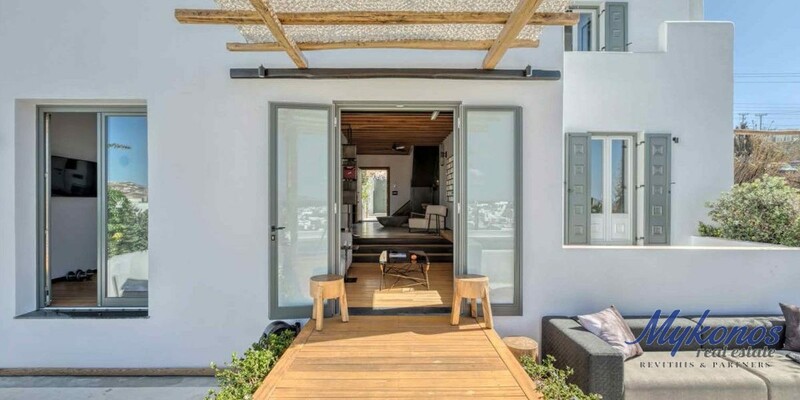 This villa is an ideal solution for those who would like to enjoy the nightlife of the Mykonian town, try out luxury shopping and taste magnificent luxury restaurants, which are spread out all over the town. 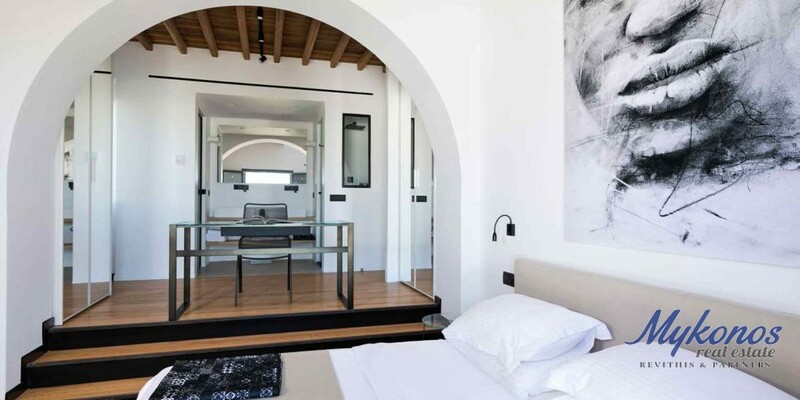 The villa has three levels, and 5 en-suite bedrooms. 4 to 10 guests can live in the villa. 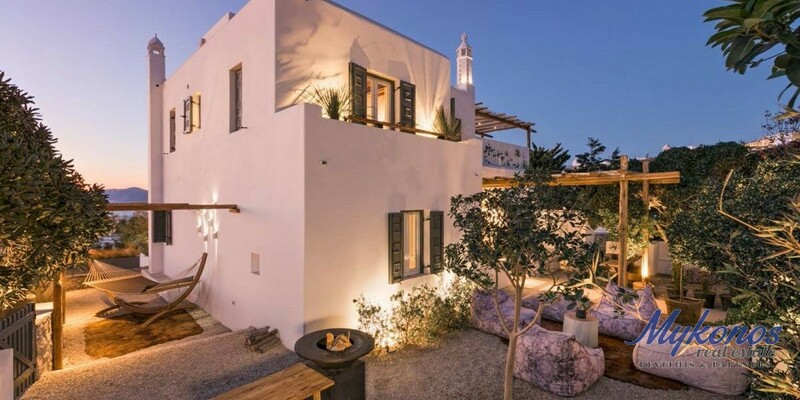 It has a swimming pool, an equipped kitchen, a living room, an outdoor area, a courtyard, a Mykonian garden and parking for 5 vehicles. The ground floor includes the main entrance and a living room of 45.8 m2 . The living room offers a direct access to the main terrace and a heated pool. 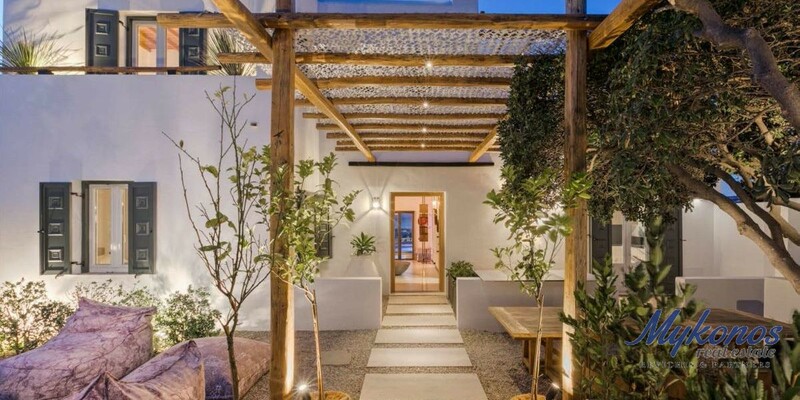 There is also a guest bathroom, pergola, Mykonian garden, cozy kitchen with terrace. 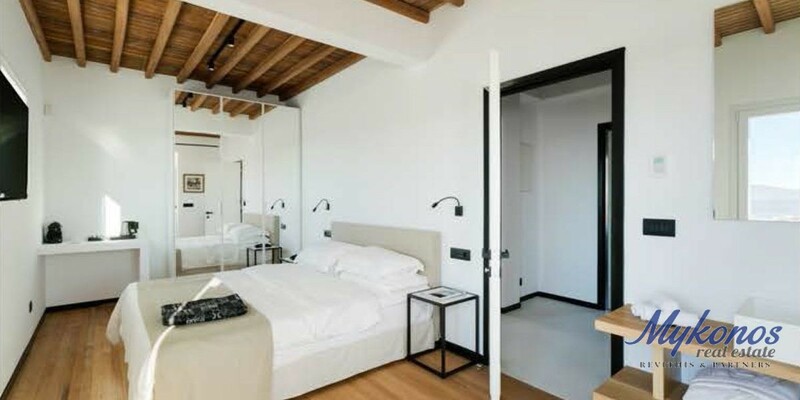 The first room of 27 m2 includes a bright en-suite master bedroom with a private terrace. 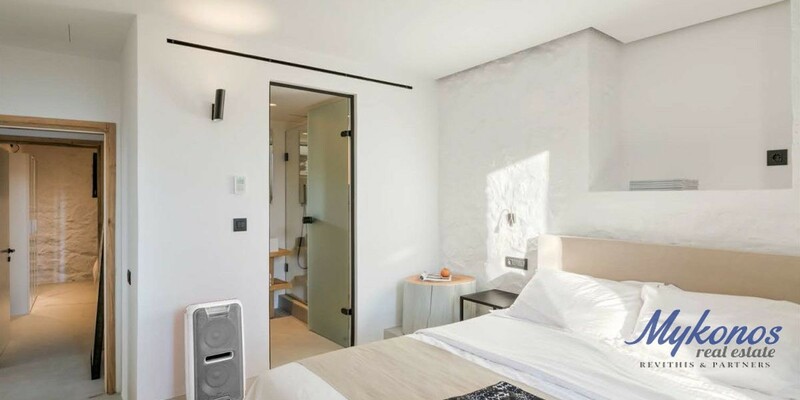 The second room of 20.5 m2 also includes an en-suite master bedroom with a private terrace. The third room of 21.4 m2 has an en-suite master bedroom. 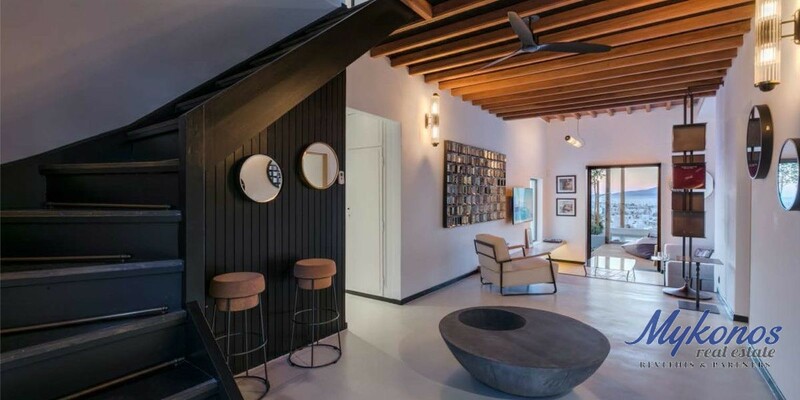 The first floor includes a living room of 8.5 m2. 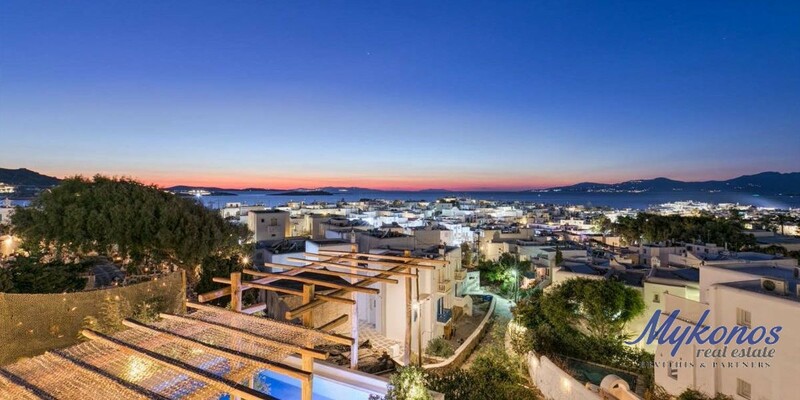 It has a direct access to a beautiful terrace, outdoor area and bar. This floor also has 2 en-suite master bedrooms where one has a private terrace, while the other bedroom has a balcony. 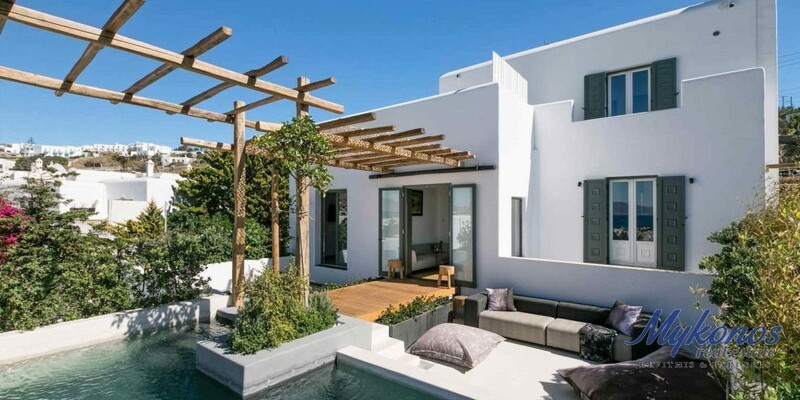 Some features of the villa include an independent pool, interior living with HD smart TV with Netflix TV, kitchen fully equipped, pool deck terrace, sunset roof terraces, garden living, Mediterranean garden, OFYR BBQ, private parking with automated gate (5 cars), and 3 pedestrian gates to town. 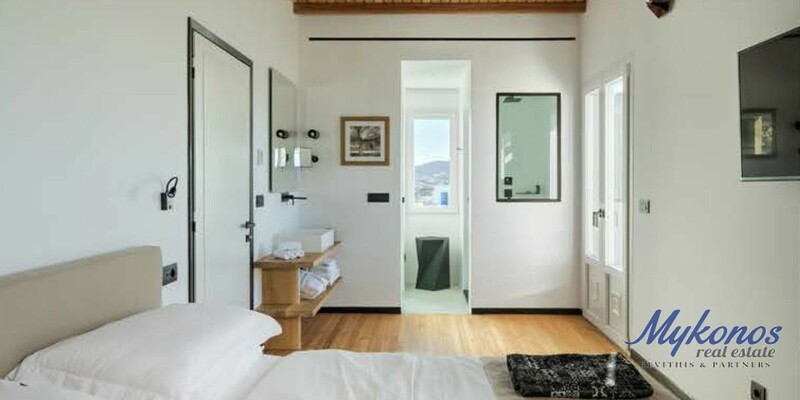 Room amenities: Coco mat prime bed, Nespresso coffee machines, safe boxes, hair dryers, rain showers, toiletries, A/C (variable refrigerant volume), double glazing systems, slippers, eyes covers, reading lights. 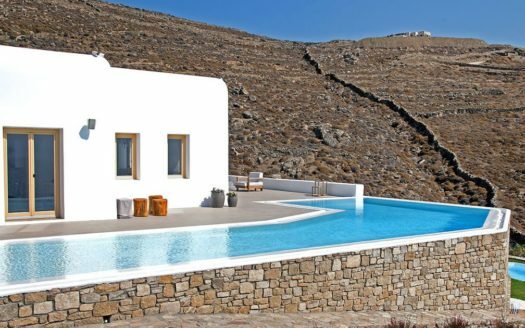 This beautiful Cycladic villa is situated in the area of Tigani of Mykonos. 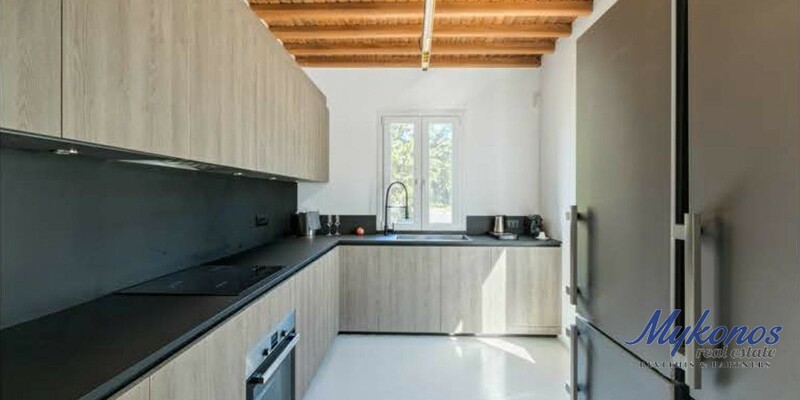 It is a brand new villa, recently constructed. 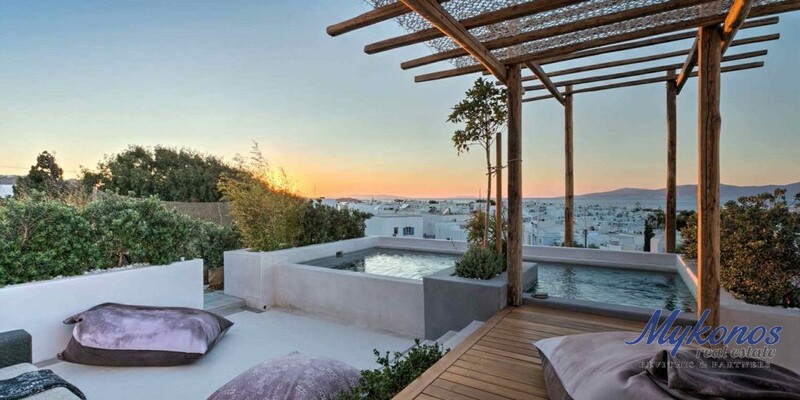 The residence has a panoramic sea view, so the guests will relax looking at the infinite Aegean horizon. 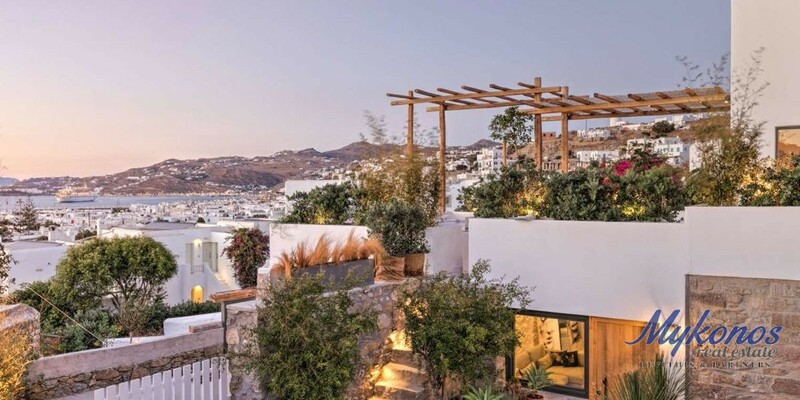 The villa has combined traditional Cycladic architecture with modern design; its white walls, simple Cycladic lines and windows make the villa bright and allow the daily light to penetrate through the windows. Therefore, the residence offers comfort and warmth to its guests. 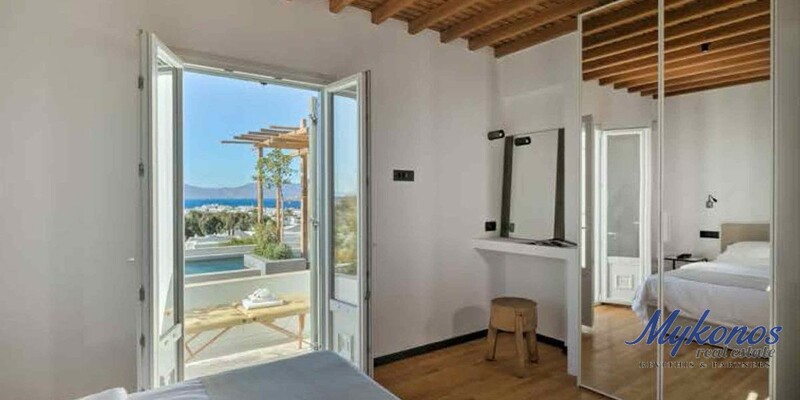 The villa also has privacy and two beaches nearby, both of them at walking distance. 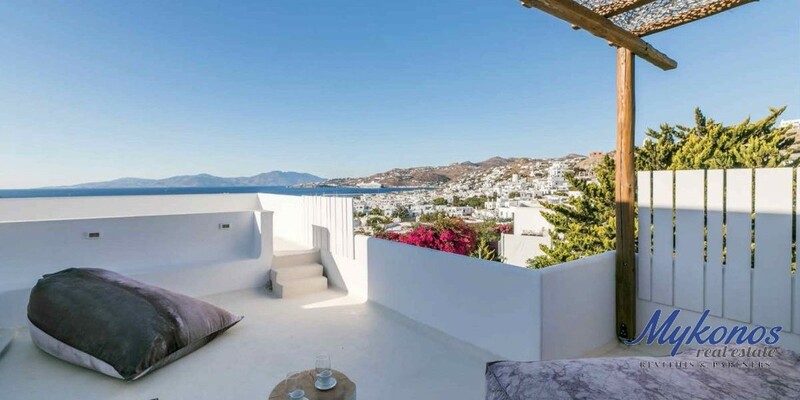 This is an ideal solution for families and also companies of friends who enjoy wild natural beauty and relaxed lifestyle during their holiday, and those who would like to experience a different side of Mykonos. The grand outdoor area offers private space for relaxation next to the swimming pool, where guests can enjoy their days sunbathing on the sunbeds; it also has a pergola which gives shade during the sunny warm days. There is also a dining area with BBQ, allowing our guests to enjoy their dinners outside in the nature. The natural environment is well preserved – cute gardens and small paths can be found around the house. The pool level has 1 en-suite double bedroom, bright living room, cozy kitchen, WC. The upper level includes 1 en-suite double bedroom and 2 en-suite twin bedrooms. The outdoors has a large infinity pool, shower, beautiful sunbeds, dining area and BBQ, pergolas, large garden, outdoor speakers, parking for 2 vehicles.